On July 30th, 1999, 30 years and two days after the first successful moonwalk, Irish American Colonel Eileen Marie Collins became the first woman to command a U.S. spacecraft. Eileen Collins was one of four children born to immigrant parents from County Cork who had settled in Elmira New York. At an early age Eileen expressed an interest in flying, the skies around her home a frequent home to sailplanes and Elmira was home to the National Soaring Museum. Her parents would often take her to the local airport to watch aircraft take off and land. Col. Collins at the controls of Shuttle Discovery on flight day one of the STS-63 mission. The first woman to pilot the shuttle. 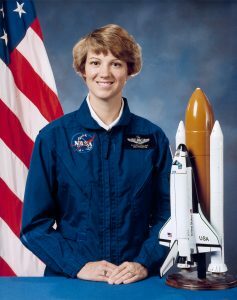 By 1989, having logged over fifteen hundred hours of flight time and having secured several advanced degrees, Collins became the second woman ever to be accepted to the prestigious Air Force Test Pilot School at Edwards Air Force Base in California After graduating in 1990, Collins was selected by the National Aeronautics and Space Administration (NASA) to become an astronaut. In the course of her 27 year Air Force/NASA career, Eileen Collins would attain the rank of Colonel and log 6,751 flight hours in 30 different types of aircraft and 872 hours in space. Collins was selected for the Astronaut program in 1990. She was the first woman to pilot a Shuttle in 1995 as part of the initial joint American/Russian Mission to the Mir Space Station. She would pilot a subsequent mission to the Mir before her third shuttle flight where she was the commander. In recognition of this special moment, Collins carried a scarf that had once belonged to aviation pioneer Amelia Earhart. 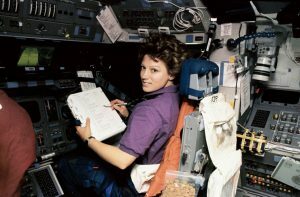 In her fourth and final Shuttle Mission, Eileen Collins would be the first pilot to take the shuttle through a 360-degree pitch maneuver to ensure that the shuttle had not incurred damage during launch.